Upload a file: A file can be a document, a picture, an audio or video file, or a collection of compressed data such as a Zip file. 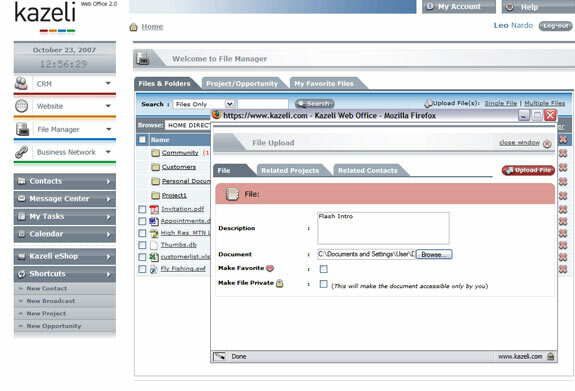 The Kazeli File Manager allows you to associate (relate) the uploaded file to one or more contacts, projects and opportunities. 1. From the left navigation, click the File Manager button. 2. Click the Upload a Single File link. 3. Browse to find the file and click Upload File button. 4. Optionally, relate file to one or more contacts, projects, and opportunities. Document Description: This can be used for the benefit of users and team members. Make Favorite: The file will be listed in the My Favorite Files section. Make File Private: This file to be accessible only by you. If this box is ticked, no other users will have access to the file. Need to upload more than one file at a time? Use the Multiple Files upload link to upload an entire folder or collection of files simply by dragging the folder from your desktop.